Since becoming a Certified Health Coach two years ago, I often get asked how I made the transition from my former career. And I’ll tell you, there is really no straightforward answer. You see, becoming a health coach is not something I had ever envisioned I would have done in a million years. When I decided to leave my long career in mental health and counseling, I still wasn’t even sure what I wanted to “do with my life.” I knew I wanted to make a bigger impact in the world, and help people to achieve better health and well-being for themselves and their families. But the “how” didn’t actually come until much later. One thing that has been instrumental in helping me transition to being a “solopreneur” in the health arena is connecting with other people and professionals who share a similar passion. Because being a “solo”-preneur doesn’t mean you have to operate in a vacuum. In fact, it’s best if you don’t. So if you’rere thinking of taking the plunge – or you have already dipped your toe into health entrepreneurship – consider ways that you can stay connected with others and support your community. Workshops have been one of the best uses of my time since I became an entrepreneur. Even if you’re seeking to have an “online business,” don’t discount the power of a handshake and hug (not a virtual one, a real one). Since I’m an “in-person” connector at heart, workshops are a natural fit for me. 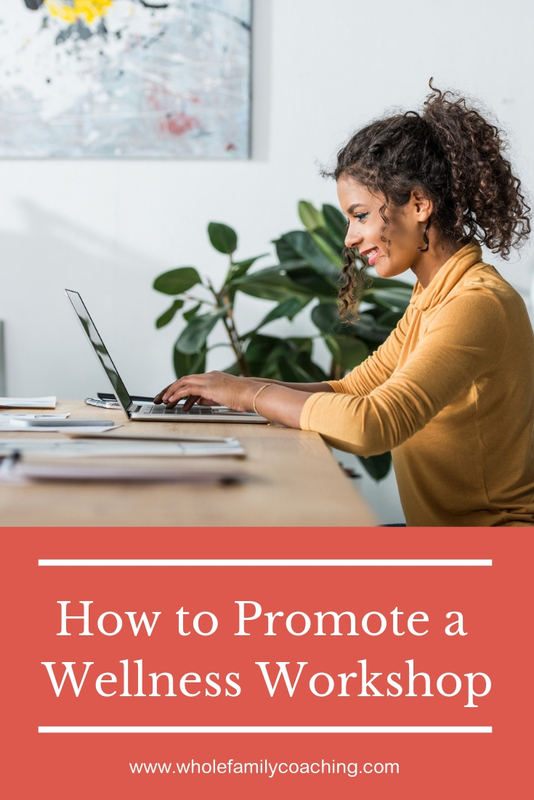 If you’ve been thinking about doing workshops – but are not sure of how to get them going – read this post at Whole Family Coaching which has a solid system to help you promote a wellness workshop in your community.